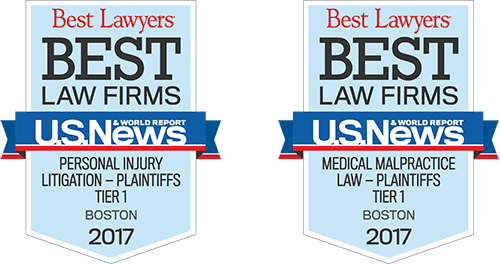 BOSTON, MA — Lubin & Meyer PC has received two "Tier One" Best Law Firms rankings from U.S. News & World Report and Best Lawyers® for 2017. The firm is ranked in practice areas of Plaintiffs Medical Malpractice Law and Plaintiffs Personal Injury Litigation. "Tier One" is the highest ranking a law firm can receive in the Boston metropolitan area. Law firms included in the 2017 “Best Law Firms” list are recognized for professional excellence with consistently impressive ratings and reviews from clients and peers. Achieving a tiered ranking signals a unique combination of both legal and professional excellence. To be eligible for a ranking, a firm must have a lawyer listed in The Best Lawyers in America, which recognizes only the top 4 percent of practicing attorneys in the US. Lubin & Meyer has five attorneys named Best Lawyers® for 2016. They include Andrew C. Meyer, Jr., the firm’s founder, who has been selected for inclusion in the Best Lawyers list since 1995, in both personal injury law and medical malpractice law. Meyer has been previously selected by Best Lawyers as Medical Malpractice "Lawyer of the Year." Additional Lubin & Meyer attorneys selected to the Best Lawyers list are Robert M. Higgins (who has also has been previously selected "Lawyer of the Year" for medical malpractice), Adam R. Satin and Krysia J. Syska for medical malpractice law, and William J. Thompson for personal injury litigation. View a representatitive list of the firm's verdicts and settlements by injury type. Lubin & Meyer is New England’s leader in medical malpractice and catastrophic personal injury litigation with attorneys practicing in Massachusetts, New Hampshire and Rhode Island.